The Award Winning, Brayden CPR Manikins present a highly innovative and effective way to teach and learn both the “how to” and “why to” perform CPR. It is the first ever manikin to allow users to visualise the effects of CPR. Brayden is equipped with three sets of interrelated LED lights that actually illuminate in direct relation to the depth and rate and compressions and clearly demonstrate the overall the quality of CPR. There are two choices of LED colour: Red or White. The functionality of the lights is the same and the colour choice is down to individual preference. Being able to see the how CPR is having a direct effect on the flow of oxygenated blood to the brain, reinforced with an audible (on/off) clicker if required, increases the speed at which skills can be both learned and retained. This ultimately increases confidence and competence in CPR skills. Brayden both looks and feels very realistic and is anatomically correct, giving people a better understanding of what to expect when performing CPR. Learners are able to perform basic upper airway management functions and expired air is expelled from the back of the manikin improving hygiene. The harmless, latex free skin is compliant with ROSCH and REACH regulatory requirements. It is easy to clean and defibrillator pads can be removed quickly and easily without leaving a sticky residue. Either battery powered or mains operated, the Brayden is both durable and cost-effective. Built to last, with few moving or replaceable parts, Brayden has been tested to endure in excess of 1,000,000 compressions. 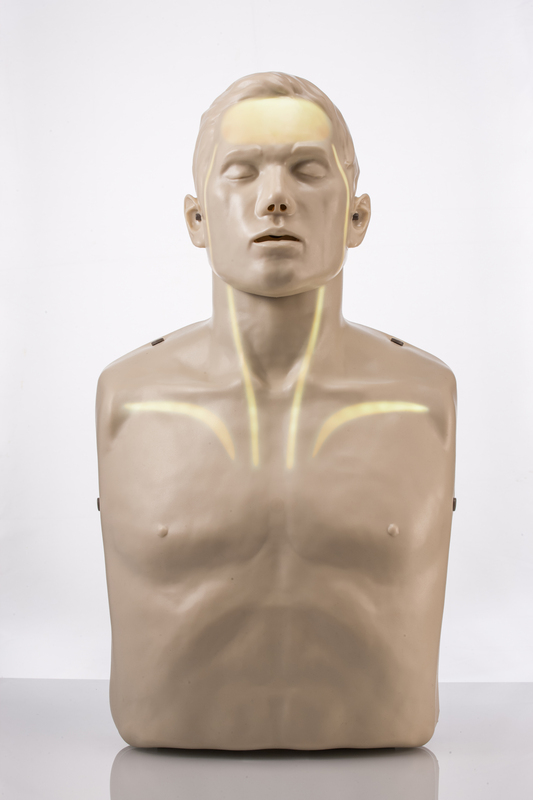 "This training manikin is a useful addition to those currently available. The light effects to show likely sufficient coronary and cerebral flows is novel and will be an effective stimulus for improving the quality of compressions"
Type:Torso Display visual flow of blood from the heart to the brain: Yes Chest compression depth and speed measuring sensor:Yes Chest movement with ventilation:Yes Head tilt and Chin lift for opening airway:Yes Airways system:Non-breathing with disposable lungs Ribs, Xiphoid:Yes Clicker (Audible feedback):Yes Length:59cm Weight:3.1kg (6.8lb)(including batteries) Packed weight:5.3kg (G/W), 4.3kg (N/W) Dimensions packed:37cm x 26cm x 62cm Operating temperature:15*C to 30*C (59*F to 86*F) Storage temperature:-10*C to 40*C (14*F to 122*F) Humidity:Relative humidity between 5% and 95% Warranty:2 years (excluding consumables) Power:AC Adapter (Input AC 100 ~ 260V, Output DC 9V 1A) Battery C type (6 batteries) As standard, a complete Brayden package consists of one CPR manikin with LED lights that illuminate the blood flow from the heart to the brain during CPR. The lights can be switched on or off as required. We are authorised distributors and a full range of spares are available and full manufacturers warranty.